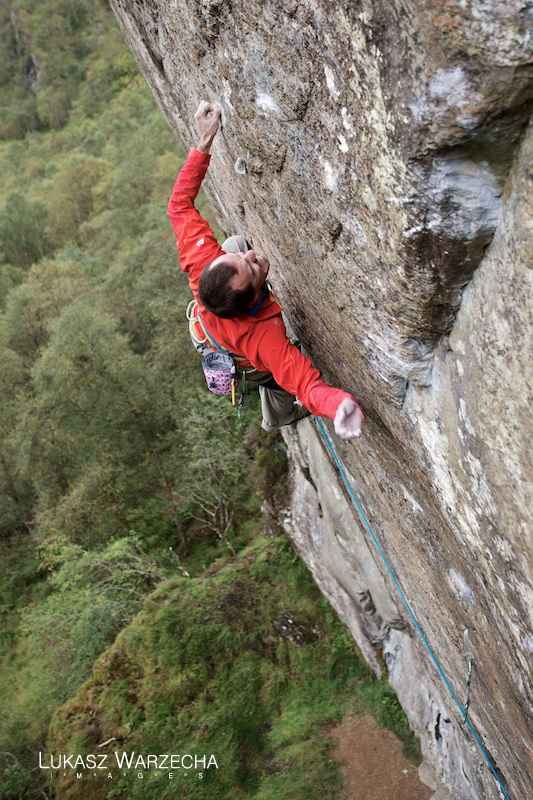 Fight the Feeling, 8c+/9a, Steall, Glen Nevis. Picture by Lukasz Warzecha. I finally nailed my Steall project. All I can say is I had a fantastic and heart stopping 20 seconds when I got through the crux and nervously continued, completely pumped to the belay. I was totally unsure if I’d make it until I had the finishing jug firmly in my hand. I think I was too nervous and full anticipation to even breathe or make a sound. I’m so, so happy with this new route. The cliff carries a lot of personal history for me and completing it is a culmination of a big part of my climbing inspiration. It’s also one of the most stunningly nice rock climbs I’ve ever seen and the quality of the rock is just fantastic. Apart from all that, it’s also the hardest sport route I’ve climbed by a good margin. It ‘went’ it straight away after I took a break to go bouldering in the alps for a week and then returning to find the long awaited perfect conditions (about 10 degrees with a breeze). Sure you could say (and some have said) I was crazy to try it through the summer heat, humidity and midges. That could be correct. Maybe I just tried it because I wanted to be trying it rather than it being the best thing to be doing? But maybe if I hadn’t had regular sessions on it I wouldn’t have got stronger on the moves and learned all the little things that get you higher on the climb. I first visited Steall as an unfit 17 year old around 1995. I still remember being really inspired by the place, and by the hard climbs. They were just so far above what I could ever imagine. 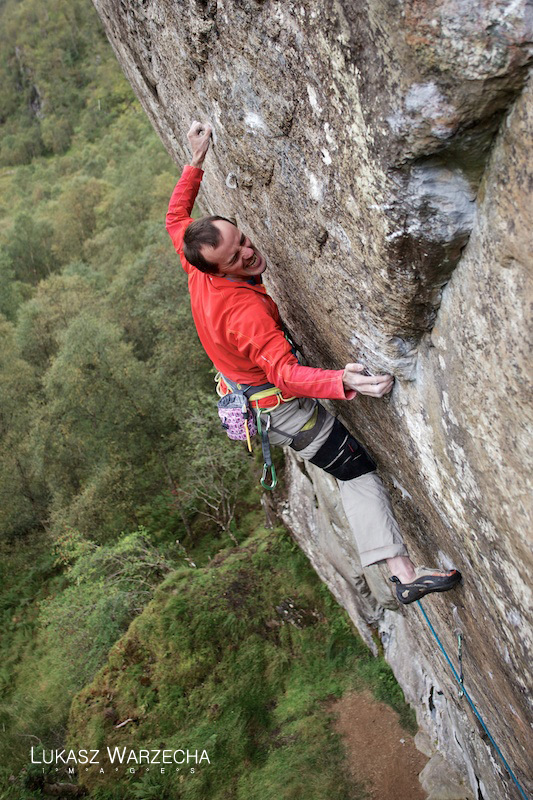 I’d seen the pictures of Malcolm Smith on Steall Appeal (8b) and Cubby on his Ring of Steall project which I’d heard could be one of the first 8c+s if he could finish it. When we went, Cubby’s draws were in place on Ring of Steall and we made it our day’s entertainment just to abseil down the crag. I was totally fascinated by how hard it must be to climb that smooth overhanging sheet of rock, and a seed was definitely sown to see how much of the huge leap from my level to being able to climb this I could jump. Starting the crux section. Lukasz and Wojtek (The Polished Project) also shot some nice film of the route which hopefully will show off what a nice route and cliff this is. I always felt it was a shame that so few people know about Steall and how great the climbing is here. Yes I know there are a couple of midges about in summer. But right now (Sept) and right through the spring it’s a fantastic place to climb. Fight the Feeling takes in most of Ring of Steall (8c+) until past it's crux and then has a bouldery main crux on the headwall above. I gave it a split grade in the end and I'll wait for the opinion of repeaters. If Ring of Steall holds it's 8c+ grade then maybe it will end up as 9a. If not then it would be 8c+. It's certainly much harder for me personally than A' Muerte (9a) that I did a few years ago, but it's always hard to tell if one route just suits you more than another. It was several years later before I returned and actually tried Cubby’s Ring of Steall project. Despite getting close, Cubby never quite finished it off, which I know was frustrating for him. I hope he can see that the vision for the line and the effort he did make carried a great inspiration for me and other climbers, which has got to be important and worthwhile. For me, the unfinished project it seemed like an obvious target to feel like I could make some sort of contribution to climbing in the highlands. I thought about it a lot and it eventually became a dream route for me. But when I tried the crux, it just seemed impossible. I wasn’t anywhere near strong or technically aware enough to do even the moves. More years later, with lots more climbing experience under my belt, I climbed the Ring of Steall project in 2007 which was a very memorable moment for me. Despite it feeling so hard during the preparation of many days working on it, I did it effortlessly on my first serious redpoint attempt, much to my surprise. This of course opened my eyes that there was more space to improve. So the blank looking headwall above where Ring of Steall heads left to finish up a diagonal crack seemed like the obvious progression. I placed the bolts and had great fun unlocking a sequence to connect a few distant tiny crimps on this. Initially, just linking the section where it left Ring of Steall to the top felt absolutely nails. In actual fact, I was stupidly missing a few obviously better methods to do the moves and eventually could link the headwall quite steadily. Eventually I redpointed through the Ring of Steall crux over 30 times but hit a wall by the time I got to the main crux on the headwall. I was lucky to have an up for it partner in redpointing during July and August, Dan, who nailed his summer project (Trick of the Tail 7b+) right 10 minutes after my top out. Linking the whole route was desperate for me. I’ve learned a lot about my climbing limitations during trying it, because I’ve tried everything to get stronger and fitter to manage it. However, just like on Ring of Steall, when I finally did it, it felt easy. So the door for further improvement is still wide open it seems! And that was my biggest problem - I had become convinced during trying it that not only was I struggling to make the improvements I needed to, but I was somehow losing my ability to climb, train, recover and have good days. Almost every attempt became a constant fight against this feeling. I don’t really know why I’ve turned into a sport psychologist’s nightmare, but I do seem to have lost a lot of confidence for some reason. The routine of preparing myself for a redpoint effort got progressively more difficult as last month wore on. I wasn’t nervous or scared of it, I’ve got enough experience to be able to swallow those feelings in a climbing situation at least. It was more that I stopped believing I had room to improve on my previous best efforts. I wondered what I could do about this feeling at the time. It was really strange - one part of my mind was telling me that just keeping going with the training and work I was doing on the route would pay off sooner or later, while the other just didn’t believe it was making any difference. The only option really was just to keep going to find out which scenario would come to pass. In the end, several small things got me there. I kept going back and changing little things in the sequence that needed changing, simplifying the footwork and using a crucial intermediate hold on the crux. I alternated periods of working the route with a little time away to train, and I did a few sessions of deadhangs replicating the specific grips I needed on the route. Finally, I went a did some nice runs during which I tried to regain confidence while hopefully burning some fat. I felt I really needed to finish the project to move on to another stage in my climbing and life. It’s taken the guts of a whole summer season, but well worth it. So I’m slightly less unfit than when I first visited Steall 17 years ago and it’s time to move on again. I have a few more wee climbs to finish off here yet before I’m completely done, but I’ll certainly miss climbing here almost as much as I’ll enjoy starting another adventure on some other steep bit of rock. While I have been waiting for the summer to come to an end and the season for climbing on small holds to begin, I’ve been trying to sort some things out. To be honest, I’ve been feeling a bit fed up with how the summer has gone. Having said that, the battles have been enjoyable. I could so easily have had very different results on a couple of hard projects had conditions been right at the right moment. But it didn’t happen. I particularly thought on quite a few attempts that I was going to get my Steall project. On reflection though, I don’t feel I really did enough to deserve it just yet. Also I went to look at a couple of cliffs I hoped would have another great hard trad new route for me, but they were a bit disappointing. Outside of climbing, I have written a lot of book which is good although much work remains and progress has been rather slow. I signed another three year contract with Mountain Equipment which is really great and gives me an opportunity to keep pushing myself in my climbing. I have been thinking a lot about my training going into the colder months and what moves to make next. This summer has been the first that I haven’t felt my fingers getting stronger. I know that it’s down to just going climbing on physically ‘easy’ trad routes for a long time and not doing any training since my elbows weren’t up to it. Already I’m noticing some small gains since I’ve been healthy and able to start basic strength work again. But my body is feeling like it will take some time to get used to strength training again. After speaking at the St Anton festival in Austria last week I had a few days in Magic Wood. The objective was just to pull hard on powerful crimpy moves as much as possible before going back to Scottish projects. It’s just as well, since the conditions were pretty bad. After a few days moping about looking at wet projects and climbing damp boulders, there was one day of decent conditions. I could do Darkness to Sunshine (8A/+) quickly and then worked on some harder things without success. I spent an hour or so trying Remembrance of Things Past (8B+) which is exactly the opposite of my climbing strengths. There’s not a lot of opportunity to lean on technique and get weight on your feet, but raw finger strength is the order of the day. It was still quite wet but I could see I probably would struggle to do it even in good conditions. On the other hand, the moves didn’t feel impossible so I don’t think a huge gain in strength to weight ratio would be needed to manage this level. I’d love to try this again sometime after a winter back on the fingerboard. I super motivated for this season to get back into basic strength training and see what possibilities it opens up. I’ve also spent a lot of time recently reading to expanding my knowledge of sports nutrition and feel like I’ve learned a lot there with much potential to do the hardest stage - putting new knowledge into practice. While in Magic Wood, waiting for boulders to dry out, I decided to go for a couple of jogs to keep trim. I found a nice track that led up into the mountains in steep zig zags from 1300m to over 1900m, above the tree line and into a lovely open mountain corrie. On the first outing, it was super humid and felt like hard work. I walked a few sections, but I sensed that the uphill running was beginning to feel close to ‘steady state’. So a few days later I did it again on a much nicer day and got on much better. I ran over 600m altitude gain in 36 minutes without stopping to walk which is the first time I think I’ve ever run so far uphill in one push. The interesting thing was that I did the run after eating lunch (I’d had 4 hours bouldering in the morning). Normally if I ever run I do it after the overnight fast to get into fat oxidation quicker. The difference was quite amazing! I know that’s rather obvious but it was still quite something to experience it. Instead of feeling like a motivational mission, it felt pretty easy. Moreover, after the harder steep sections I could feel my legs wanting to run faster as soon as the angle decreased again. I guess habitual runners must be used to that feeling but it’s nice for an amateur to feel it even once. I remember reading when I started climbing that Messner, in training for the first ascent of Everest without oxygen in 1978, 'claimed' to be able to run 1000m uphill in 35 minutes. So I’m officially 3/5ths as fit as Messner. Im not sure whether to laugh or cry. Perhaps I put in some training for my enchainment idea after all? I wrote some ideas about mental strategies for motivating yourself to run uphill on the training blog here. In conversation with... Reinhold Messner from MOUNTAIN EQUIPMENT on Vimeo.